Make me a vessel of Your hope. Where dreams are dead, come wake them up. A new horizon, I feel it rising. Make me a vessel of Your hope. This weekend has been one to go down as leaving mark on my spirit which time cannot fade. The exceptional team of creative people who make up the worship and production teams at Journey Church Asheboro planned and organized an evening of worship to unite our community in one voice and one experience with our God. The evening was full of music, spoken word, video and live and spontaneous art. My role in planning this event was the visual art. I was set free to create as the Spirit led and use whatever methods and materials that inspiration demanded. I prepared in tight coordination with the worship band and selection of music for the night. As the team was led to songs for that night, a theme began to appear; freedom. I spent weeks reading and meditating on the concept of freedom. What does it mean to be free? What binds us and fuels our deep longing to find and embrace freedom? Why does freedom matter? What does freedom look like? The more I tumbled over this concept, the broader my range of possible subject matter became. I thought of open landscapes, blue skies with gentle cumulus clouds mingling leisurely together. Next, birds in flight, the ultimate cliche image for freedom. My mind traveled to Christina’s World by Andrew Wyeth. I thought of blues and wispy grays, colors of calm and freshness. Despite all my ideas, none seemed to entirely capture experiencing freedom. That’s when it hit me; freedom is too large to be adequately communicated in one image. Freedom is not domesticated. It is far too wild to be contained. Freedom is a scandal. Freedom is an experience. The only way to properly convey freedom in an art form is to lead people in an experience of it. The art I create on this night could not be a planned with an end-goal image in mind. It would have to be abstract, I would have to move quickly but intentionally, and it must be completely spontaneous. The only preparations I made was selecting my medium. I am always pushing myself to try new methods and experiment with ways of reinventing old ones. I had used spray paint in art before, but always used it “safely” by spraying large areas or creating stencils to tame the spray stream. This time, I would allow the full breadth of the spray stream to behave freely. I also find acrylic pours and the uninhibited dance of acrylic pours and ink on ceramic tile exciting, but not braved those methods. I chose to combine these methods and discover how they could partner together in a marriage of freedom and abstraction. After purchasing acrylic and watercolor canvases, my adventure into freedom began and the results were a beautiful mess. Like any good science experiment, the initial messes gleaned fantastic discoveries and refined processes. I was almost ready to share this experience with any eye who will see. With my method and medium set, I developed a corner of our worship center into my studio for the night. With a table from the a preschool classroom, industrial trash bags from the kitchen and a $14 floor lamp from Walmart, art was ready to commence. The creating corner was set adjacent to the worship band so we could watch each other and coordinate how we would experience this night individually into a unified, corporate experience. The very fluid medium I used required the canvas lay flat, which posed a visibility problem which was crucial for this experience. Using a GoPro camera connected to a TV, everyone in the worship center could watch the art come to life as paint hit the canvas. Knowing speed I’d be moving and the minimal coverage required to complete the practice images, I brought multiple canvases to use throughout the night. Our intro song was ‘Here as in Heaven’. Lighting played a crucial role in setting the stage for this worship experience, so I soaked in this song, preparing my heart and mind for action and waiting to illuminate my work space. The first line of this song, “The atmosphere is changing now. The spirit of the Lord is here.” was an invitation for us to encounter our Creator and for Him to engage with us in this moment. As the band began playing ‘Reckless Love’, I clicked my power strip switch to the ‘on’ position, electricity surged into the filament of my lamp’s bulb and the TV began projecting the blank canvas facing me. ‘Reckless Love’ was followed by ‘Spirit Lead Me’, a song which has quickly become a favorite of mine to play and worship though. Following the heart of this song, the second painting was truly led by the Spirit. This one is layers of ink, reacting to rubbing alcohol, then masked by spray paint and layered again. We entered a short speaking time once the song closed, where I continued to let the image flow out of me. Our experience of worship and freedom continued as the band returned to play “Pour Me Out (Vessels)” – incorporating the lyrics at the start of this blog, and “King of My Heart.” I began the third painting with a spray painted base, then pouring rubbing alcohol directly on the canvas and allowing it to pool randomly. The alcohol reacts with the acrylic ink to give it the freedom to dance and swirl together. The spray paint reacted more subtly (I used a sugar-based, odorless spray paint). “King of My Heart” inspired the crown-like swath of black and yellow ink in the bottom left corner. This final canvas was the largest of the four painted that night at 27″ x 27″ (the previous three were each 16″ x 20″). I incorporated all the methods used in the other paintings on this final production; using found objects as stencils, pooling alcohol before applying ink, pushing ink to spread and combine by blowing through a straw, and layering the medium. 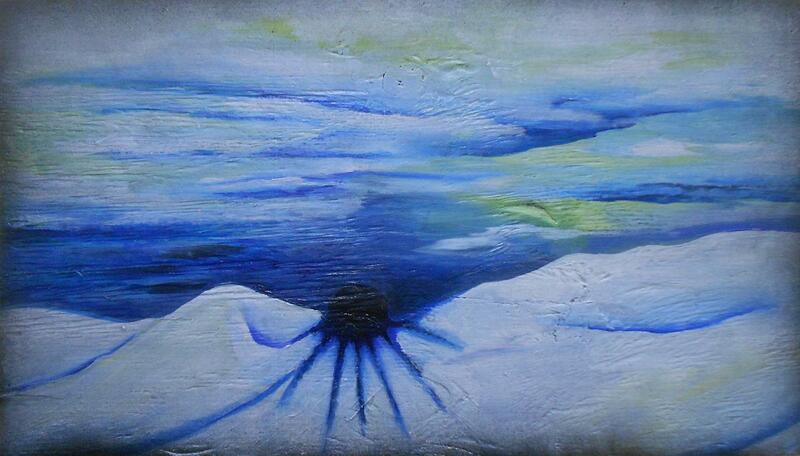 Inspired by “Love Has a Name”, this painting includes a name; YHWH (pronounced yah-weh), a Hebrew name of God. In “Freedom”, we sang “Where the Spirit of the Lord is, there is freedom!” The bottom right corner in this painting displays an icon which represents the trinity, and the complete manifestation of the nature and spirit of God. It is a Celtic triquetra knot, which is interpreted to represent the union of mind, body and spirit. It is also the layout of the Venn diagram, which exposes the principle of primary and secondary color theory, where primary colors combine to create secondary and all colors unite to become absolute white. Dance like the weight has been lifted, grace is waiting. Come out of the dark, just as you are, into the fullness of His love. Oh, the Spirit is here, let there be freedom! I don’t know about you, but 2017 was a very long and often difficult year for me. 2017 coming to an end was life’s Christmas present to me. I welcomed 2018, but with with cautious reservations like drinking a steaming fresh cup of hot cocoa. I am confident I was not alone in this feeling. Michael and the team at Journey are sensitive to this spirit of apprehension as well, choosing to kick off 2018 with a series titled ‘Uphill’, inspired by a quote from leadership coach, John Maxwell. The first and most significant step in developing uphill habits is focusing on what you do. Where your feet take you (or where you allow them to go) determines who you are. One thing that life and humanity guarantees is that we will create habits in our life. Some good, some not so much. It is a mistake to consider habits lightly. Your habits are your responsibility. You define your habits, but then these same habits will define you. You stand at the 2018 block of Another Way. You get to choose your road from here. my fault. It takes forever to find a way out. I walk down the same street. There is a deep hole in the sidewalk. I pretend I don’t see it. I fall in again. I can’t believe I’m in the same place, but it’s still not my fault. It still takes a long time getting out. I walk down the street. There is a deep hole in the sidewalk. I see it is there, but I still fall in. It’s a habit. My eyes are open. I know where I am. It is my fault. I get out immediately. Change what I do. Check. That’s really easy to say, but how do I actually do it when my habits are so deeply part of me? You must take control of your mind, be the master of your thoughts. How we think determines how we feel. You can’t change your behavior without changing the way you think. My 11 year old son drew with me this week! His explanation of his drawing is the person is thinking of things he wants his life to be, while what is happening around him are habits he needs to change in order to make his thoughts a reality. Well, ok. I am focusing on what I do and controlling my mind so it stays focused on uphill habits and not sliding comfortably back into old routines. Now what? Keep your life aligned with your purpose. Guardrails along the interstate are put in place to keep drivers safe. They don’t actively hold vehicles on the road, but they do prevent an accident from becoming something catastrophic. Using our actions and out thoughts, and leaning on God’s direction, we can put up guardrails that keep our lives aligned with the path we travel. That doesn’t mean accidents won’t happen, but it will ensure bumps in the road won’t change our direction. The Israelites marked each milestone on their journey to the Promised Land with a pile of stones, which inspired them to keep moving; at work of art to mark every accomplishment. Out lives are God’s work of art, His workmanship. The word in today’s drawing is the original Greek, translated ‘workmanship’; or more literally, work of art. God builds our lives as His work of art, we climb uphill, becoming our lives by living God’s work of art. The greatest asset to the trajectory of our lives are our relationships. The crowd we run with, the people we let into our circle. Psychology has studied social phenomenons of friendships and discovered many details about an individual can be determined simply by looking at who they hang out with. Political views, annual income, consumer habits, even the number of children you have and how healthy your most intimate relationship will be can be predicted with astounding accuracy by looking at your five closest friends in a lineup. Relationships being our greatest asset, also makes us vulnerable to them becoming the most significant threat to our ability to grow. Choosing our relationships wisely, the ones to start, to keep and to change or end entirely, is critically important to defining our lives and holding to our path. Nurture – Anything left on autopilot is destined to crash. We feed each other, but we also depend on each other. We are responsible for feeding each other well, and just as responsible to ensure we are being fed well. Having just finished up our summer series on prayer, we dove into a new focus this week; Titus – Believe. Do. The day’s message spoke to me at a very personal level. Based on the first chapter of Titus, it’s mostly words meant form me than imagery. I lay my life down to live like Christ; but I must remember, I am not Christ. It is not my place to be anyone’s savior. I am not responsible to rescue people, even from themselves. Disappointing someone else by creating and maintaining a good relationship with myself does not make me a failure or a disappointment. 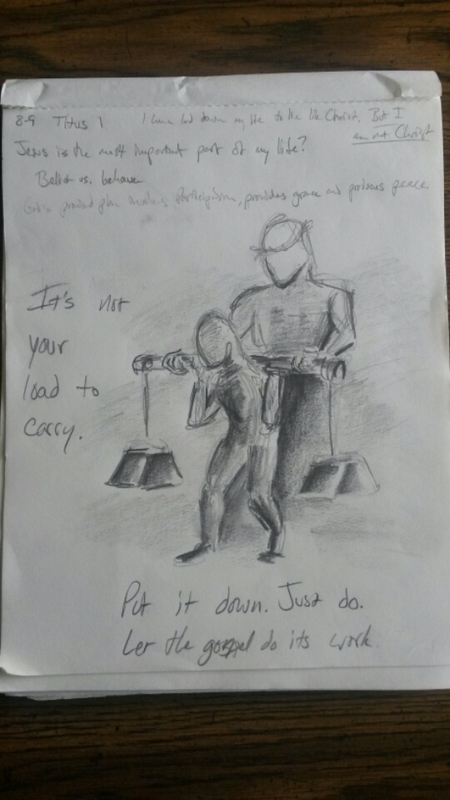 It’s not my load to carry. The gospel is not just a message of spiritual salvation, it is freedom to acknowledge and live in the light of self worth. The gospel is the manifestation of complete love; salvation lies within. Literally defined, the word advent is a noun which announces the arrival of a notable person, thing or event. The Christian tradition accurately applies this word as the introduction of the Creator to his creation. Our maker, our king, the explanation of our affection, our God has arrived. A critical precursor to understanding the weight of Advent is understanding ourselves and our place in the story. The moral, ethical and spiritual struggles so many experience today are not products of social evolution, nor are they problems which cultures 2000 years our senior would find unfamiliar. The details have changed, but the root of our problem remains the same, altruism does not come naturally and the narcissistic beast which leeches itself on each of us from birth is not easily detached. Tantamount to our DNA, the common thread we share with all of our ancestors is the instinctual drive to serve ourselves, suppressing the needs of all others in order to feed our internal monster. All too late, the curtain is drawn and the true nature of the dreams we selfishly chase is exposed – to be the object of your own affection is to be alone. History documents an endless cycle of nobility leading to egocentricity and civilized captains mutating into maniacal oppressors. All of these inflations being subsequent to the inevitable collision with ourselves which travels down every human connection in an explosive outbreak of anguish and leaves us empty. God arriving in the human form of Jesus was not the equivalent of our parent walking into our bedroom to throw down a lecture, this was your closest friend stepping into every crevice of your life and saying “I know you’ve tried and I know your mistakes. What’s past is gone, let’s do this together.” Jesus’s life was not a regulatory, administrative mission. It was the ultimate expression of love to us which set the ultimate example for us. His life was, and still is, the flame that illuminates our darkness. No single image could ever be expected to carry the motivation for celebrating Advent much less the gravity of this man, arriving in the skin of this baby, in this place and at this time. Each week in during this season will produce a unique work of art, individually inspired to relate a specific characteristic of Advent. Beginning this season is our transition from darkness into the illumination of the light which is rising. Focus intensely on the positive image of the painting, allowing the shapes and colors to burn themselves onto your retina. The barren landscape feels very isolated, very cold, but also light. Loneliness tugs on your soul like the weight of an iron anchor plunging into the depths of the ocean. In simultaneous irony, the snow-covered hills reflect the lightness of the gently dancing clouds draw you closer into this world’s embrace. Peering over the frigid landscape, you almost feel a stiff winter breeze slide its icy fingers beyond the protection of your layered garments and violate every cutaneous detail you’ve worked so hard to conceal. The setting sphere appears sun-like, but its dismal blackness kidnaps all your strength in a violent back draft. What we perceived as our light has suddenly become our darkness. After 45 seconds or more, look away from the cold landscape and toward a solid, flat surface. The inverted image will be revealed. Your eyes reveal an explosion of colors which jolts you into a new awareness. The dark is now light, the cold grows warm, your loneliness chased away by a new presence. The void that raped your soul of its stamina erupts with a brilliance that sheathes you like a lover’s sudden embrace. The thirst of your soul is immediately quenched by a reassurance of security so personal that it reanimates the very confidence your previous affections endeavored so intensely to extinguish. You now feel yourself standing a little taller. Air rushes through your lungs in a dance of freedom as your head raises skyward. The sun is rising, a new day beginning. This is the start of Advent.